UPDATE: The Lord of the Rings Location Guidebook Extended Edition is now available. It’s a coffee table paperback edition (size: 21.5 x 22.5 cm; 8.45 x 8.85 inches) running to 176 pages and is published by HarperCollins; ISBN: 1869005301 and 1869505301. List prices are US $24.95 and UK £13.95, and is available from good online book retailers including Amazon.com and Amazon.co.uk as well as all good bookstores. 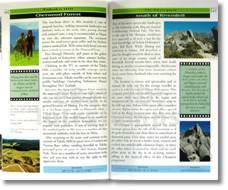 A compact traveller’s edition Lord of the Rings Location Guidebook Second Edition is on sale at Amazon.com and Amazon.co.uk. Or email to purchase direct for around US $15.95 or UK £9.95 (limited availability). NEW ZEALAND IS now seen as the embodiment of Middle Earth to legions of movie goers and JRR Tolkien fans around the world. Therefore it’s not surprising that the Lord of the Rings Location Guidebook - the definitive guidebook to locations used in the making of the Lord of the Rings motion pictures - grew out of the personal enthusiasm of Ian Brodie, a devoted Tolkien fan with a special link to director Peter Jackson (Heavenly Creatures, The Frighteners, Bad Taste, Brain Dead, and Dead Alive). Full of contributions from the movies' cast and crew, and an article on location selection by renown Tolkien illustrator Alan Lee, this 128-page, full-color guidebook provides unrivalled access to the actual locations used during the 274-day and -night marathon shoot from October 1999 through December 2000 of all three movies simultaneously. BRODIE HAS WRITTEN this guide book for the huge army of fans of both Tolkien’s literary and Jackson’s cinematic vision who are interested in seeing for themselves where the three movies: Fellowship of the Ring, The Two Towers, and Return of the King were filmed. 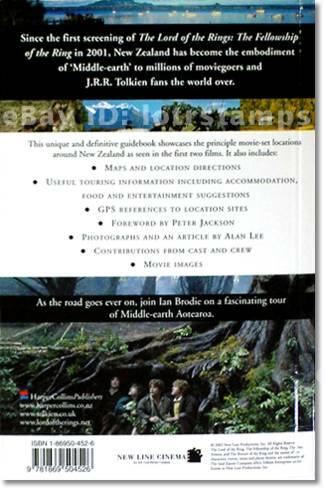 While all the traditional guidebook elements are included - maps, road directions, accommodation and dining suggestions, other local sights - his book also skillfully weaves in strands of local history and Maori mythology, with Elvish names, story references and behind-the-scenes glimpses from cast and crew, making this a must-have guidebook to Middle-earth (Aotearoa). Peter Jackson, who with partner Francis Walsh wrote all three films scripts in collaboration with several others, has provided an insightful Foreword, and numerous quotes from cast and crew are included throughout the book. Those looking for specialist Lord of the Rings activities and tours will find the numerous website and tour company listings highly useful in planning your own Middle-earth adventures. NUMEROUS DETAILED MAPS with easy to follow directions including precise GPS coordinates help you accurately pinpoint key movie locations. 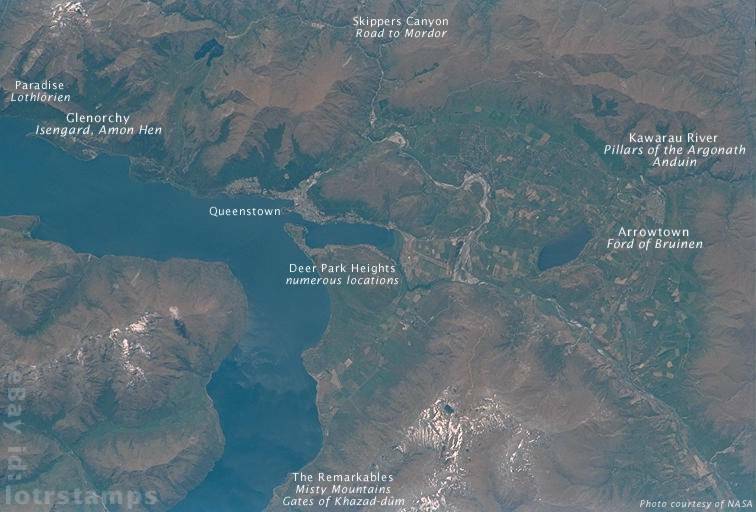 For example around the southern resort town of Queenstown in a day you can visit the locations used for: Pillars of the Argonath and Anduin on the Kawarau River and Road to Mordor in Skippers Canyon, then Ford of Bruinen in Arrowtown before backtracking to Isengard and Amon Hen in Glenorchy. For the more adventurous take a short helicopter ride to see the Misty Mountains and Gates of Khazad-dûm on the slopes of The Remarkables, then a hop across to Lothlórien in Paradise valley before heading on to more locations. 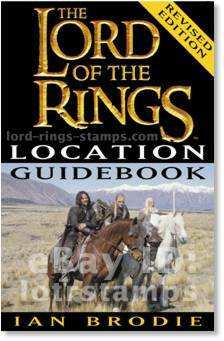 Fully indexed by location - both our earth and Middle-earth you'll discover that many of the locations are easily accessible if you know where they are - and this book shares all the secrets! IT'S HIS NINETH book and though the others have been about his other passion, Warbird aircraft, there was a link between planes and JRR Tolkien’s Middle-earth as Ian remarked, both come alive when photographed against New Zealand’s stunning landscape. The Lord of the Rings Location Guidebook has been endorsed by New Line Cinema and many of the colour photographs including those of Pierre Vinet’s depict scenes from the movie trilogy including out-takes and behind the scenes glimpses of the cast including Aragorn (Viggo Mortensen), Éowyn (Miranda Otto), Arwen (Liv Tyler), Boromir (Sean Bean), Frodo (Elijah Woods), Sam (Sean Astin), Gandalf (Sir Ian McKellen), Galadriel (Cate Blanchett), and Saruman (Christopher Lee) among others. Ian Brodie (50) is curator and a director of the NZ Fighter Pilots Museum in Wanaka, and an established and successful aviation writer, who has been closely involved in the organization of the Warbirds Over Wanaka air show for many years. In spite of having read Lord of the Rings around 39 times he still finds time for a normal kiwi life i.e. flying vintage aircraft. First Edition addendum: Hobbiton (page 17-19) and Bag End opened to the public from December 2, 2002 - visit Hobbiton Tours for daily tour details. Complete listing of differences between first and second edition. All images, logos and trademarks are the property of their respective owners. Portions of the HTML code, images and text contained herein this webpage are copyright 1999, 2001 - 2018 Agitprop Associates and are protected under United States and International copyright laws, conventions and agreements. All rights reserved. This website is not affiliated with New Zealand Post, Weta Workshop, or any other organization herein mentioned. Agitprop Associates is a participant in the Amazon Europe S.à r.l. Associates Programme, an affiliate advertising programme designed to provide a means for sites to earn advertising fees by advertising and linking to Amazon.co.uk.